Digging to recover artifacts before construction. Archaeological data recovery a few years back in the Town of Coxsackie, New York. Frigid wind blowing snow in the faces of bundled-up seekers of the past as they trudge knee-deep through the icy crests of shifting drifts... What? 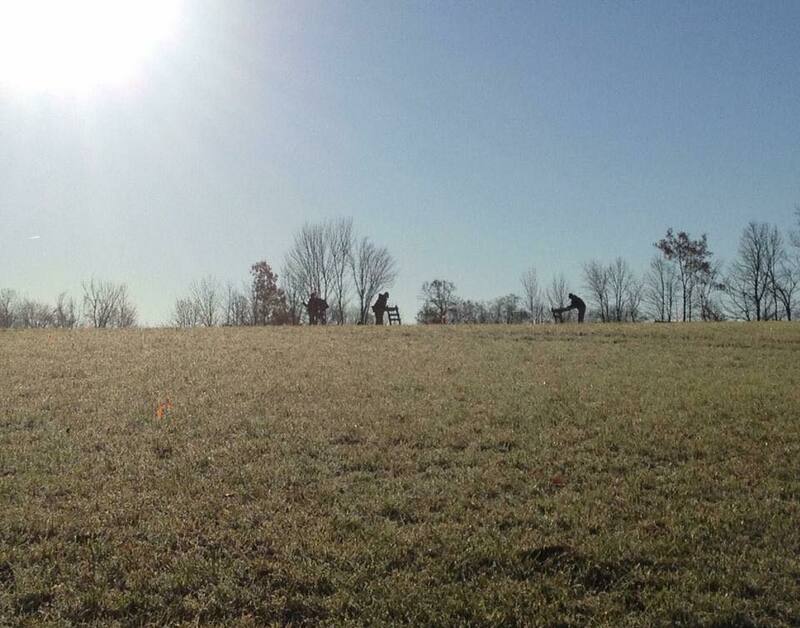 The field crew keeps warm by working hard on the survey of a Phase 1 project in Stillwater, NY. Let me introduce you to winter-time archaeology in the State of New York. I don't want to make it sound too bad. There are those memorable days when it's very cold and getting the job done takes extra dedication. But some days are better than others. Just last week we were out in mostly sunny weather with temperatures reaching the 30s by early afternoon. And some winter fieldwork days are even better than that: Sunny days when you might actually take off your coat and roll up your sleeves. That being said, however, on the cold days, dressing in layers and using hand and foot warmers helps a lot. Many of you know this, and certainly, archaeologists are not the only ones who work outdoors in the winter. People do winter fieldwork in a variety of professions for the same reason: we have clients who are getting ready for construction. Screen and shovel, awaiting the gloved hands of an archaeologist to continue work in a field near Saratoga Springs, NY. A good example of the snow cover acting as an insulator for the ground beneath. There is a good reason New York State archaeology is conducted in the winter: Archaeological data are needed to satisfy environmental review and historic preservation requirements so that construction projects can proceed. Often, these projects need to avoid disturbing archaeological sites, or at least adequately take into account how they might affect archaeological sites. People who want to build in the spring or summer sometimes need archaeology done in the winter. This process starts with a Phase 1 archaeological survey, an investigation of whether archaeological sites occur within a proposed construction area. The Phase 1 survey includes background research: checking files of archaeological site records, researching old maps, visiting the project site to evaluate its setting and condition. This work is sometimes called a Phase 1A archaeological or cultural resource survey, and this part can be done any time of year. But the full Phase 1 survey has a Phase 1B part involving fieldwork such as test pitting. Most 1A surveys find that the Phase 1B is warranted, and indeed necessary to meet State Historic Preservation Office (SHPO) requirements. 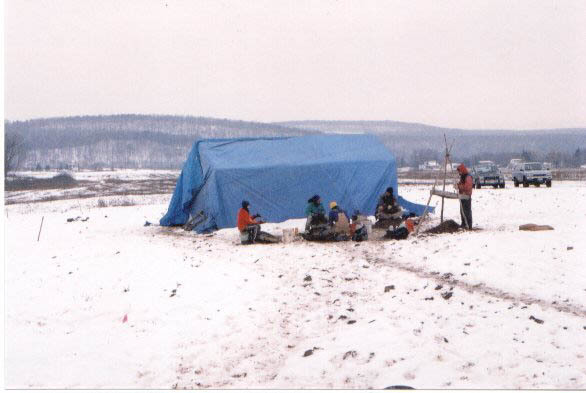 The Phase 1B fieldwork can be performed in the winter if the ground is not frozen. You probably have realized by now we won't shy away just because it's cold: the big limitation is frozen ground. I find that in most years in the Hudson Valley region the ground freezes sometime in January, if it freezes at all. 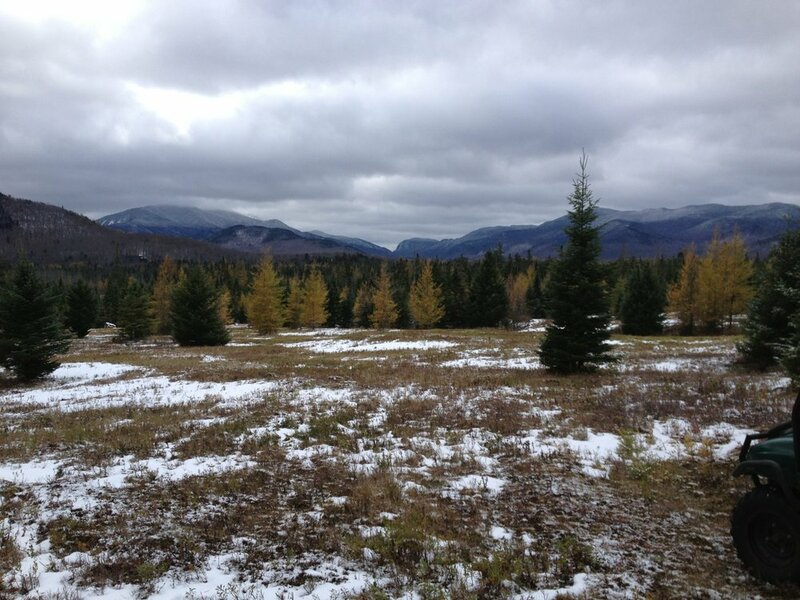 Wooded areas with thick leaf litter and areas covered with snow stay unfrozen the longest. There have been some years recently when the ground in the woods either did not freeze, or froze late and thawed early (staying frozen for maybe 3-4 weeks). 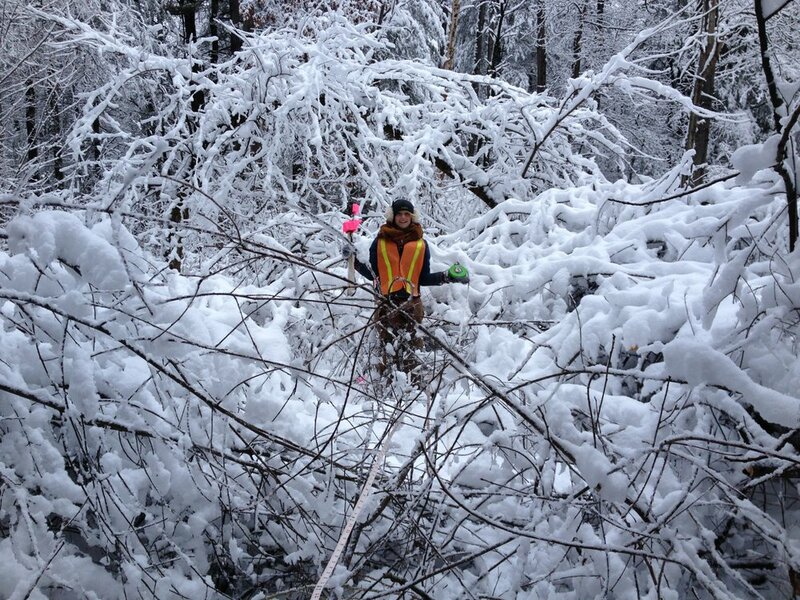 Last winter we shovel-tested a wooded area in Ballston, New York during February, and at the end of February we shovel-tested a project site in Warrensburg. In winters when the ground freezes, it routinely thaws upward toward the last crust at the surface. During February and March, a thick, insulating cover of snow may enable the ground to thaw before winter is over, sometimes weeks before it's over, as we found in Cobleskill one winter. So, often when someone needs to hire an archaeologist in the winter, despair about schedules may be premature. First of all, the background research can be performed. In addition, it may be possible to complete the field archaeology if the project area is wooded, if it has been snow-covered much of the winter, or if it is in a location such as an urban parking lot where a backhoe is needed anyway to test below paved surfaces and fill. We do fieldwork every winter. 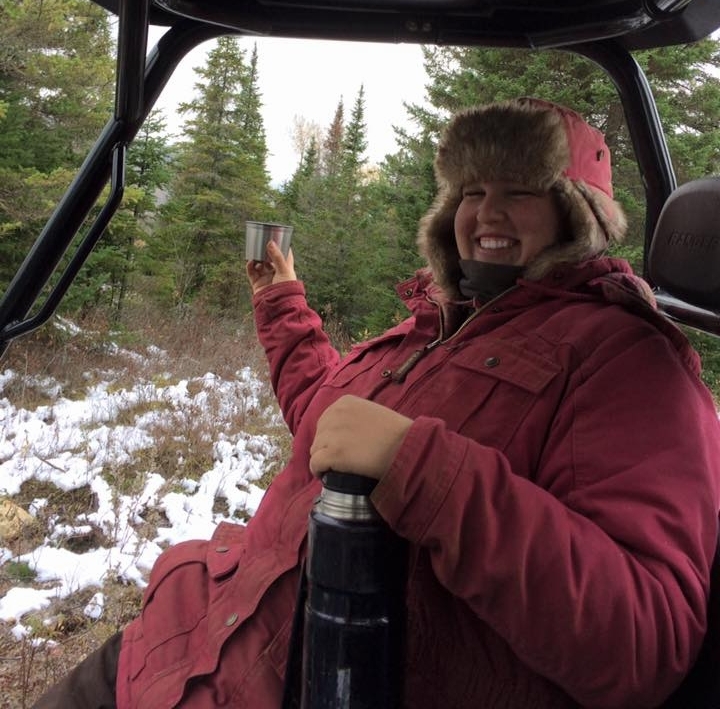 The photos shown here represent winter fieldwork performed over the years (with cold hands and warm smiles) by some of the most skilled and dedicated field archaeologists. The captions give a little context on the work and results. 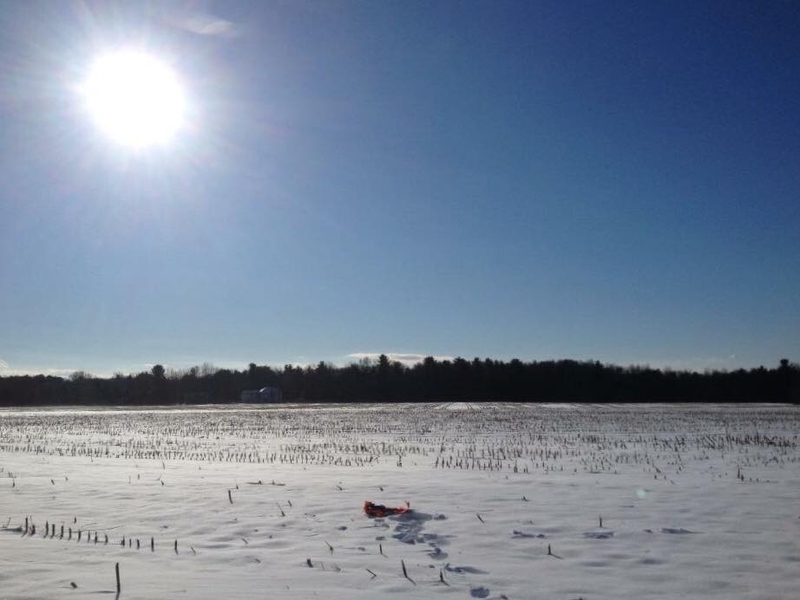 Snowy fields won't stop a Phase 1 archaeological survey in Saratoga Springs. Trudging to the cars after a cold day shovel testing in the City of Saratoga Springs. One of the Saratoga Springs finds, January 2017. 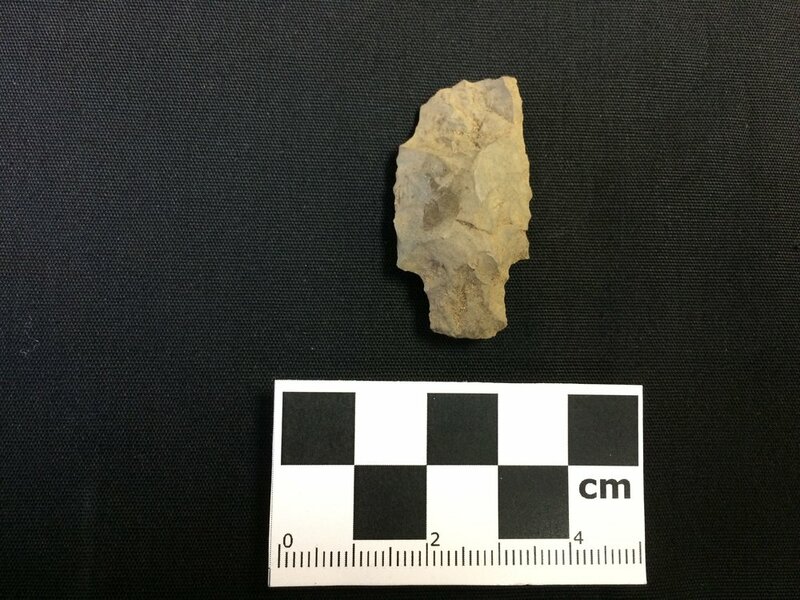 This Lamoka type point was a stray find, possibly broken in repair during a hunting trip 4000 years ago. Some onion patterned ceramic fragments recovered on a wintry project not far from downtown Saratoga Springs. A great example of ample leaf coverage insulating the ground in the woods in the Town of Moreau, near Glens Falls: March 2017. This photo was taken in December, 2014, in some very snowy woods near Saratoga Lake. Now part of a well-known meme, it has circled the globe each of the last 3 winters, reminding us that "If your're cold, they're cold..."
A beautiful winter work day view of the Town of North Elba, Lake Placid region as winter set in during late October, 2016. Don't forget your coffee (or cocoa) break on winter fieldwork days! Our kind client brought us some in the Town of North Elba, Lake Placid region. Winter fieldwork doesn't always mean snow... Here, before the ground freezes, the crew works in 12 degree temperatures in the Town of Ballston, NY. Winter 2016-2017. The crew was gifted with a nice view of a rainbow on a warm, wet day in the Town of Ballston, January, 2017. Moments like these make the outdoor work much more enjoyable!